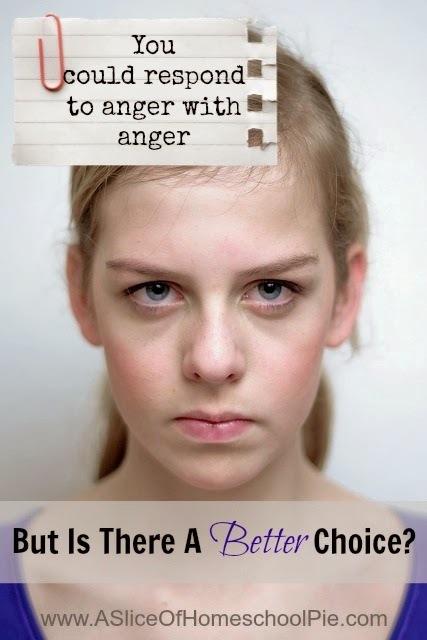 A Slice of Homeschool Pie: You Could Respond to Anger With Anger, But Is There A Better Choice? You Could Respond to Anger With Anger, But Is There A Better Choice? This weekend as I was getting ready to pull out of a parking spot at a nearby grocery store, I saw a pick-up truck backing up into what looked like the spot where I was sitting. I was waiting for a pedestrian to walk by. However, I saw that the driver of the pick-up truck was continuing to back up, so I honked my horn at him as I did not want him backing into my vehicle. The pedestrian, who must have thought I had blown my horn at him, looked at me and shouted some expletive words at me. I was flabbergasted! I found myself shaking my head in disbelief at his response to the situation. I decided on Option C.
I rolled down my window and respectfully said to the man, "Sir, please calm down. I was not honking my horn at you." However, his companion's response to me was, "Just relax." Alright, I have to admit that my honest thought to her response was, "Are you kidding me?!" I mean, what would you have thought? I was not the one who shouted expletives at them, nor was I at any time disrespectful in my manner of speaking to the gentleman. After I left, I realized that I was shaking my head during the whole time that I was driving. I found it difficult to understand why someone who saw that the person they were with had not only mistakenly overreacted to the situation, and was disrespectful in the manner in which he handled it, would shift the blame onto me as if I were the one who had thrown out expletives at them. At this point I stopped my line of thinking and realized I had another choice to make. I could either choose to continue to mull over the situation in my head (at the injustice I felt), and in turn get angrier about it (the more a person thinks about a situation like this, the angrier he/she is likely to get), or I could choose to pray. My husband often tells me that one of the character traits he most admires about me is my ability to see the positive in people. I decided to put this trait into action and pray for the man and woman right then and there, but they weren't the only people I prayed for. I also prayed for myself. In praying for them, and myself, I was able to let go of my own frustrations. I realized as I continued on my journey that I was no longer shaking my head. The next time someone angers you, take these things into consideration and instead of responding to anger with anger, consider praying. It will not only help them, but it will also help you. Remember, you never know what people are dealing with in their own lives, and although it may not excuse their behavior, it does invite a prayer over their lives and your own. So, what's a better way to react to anger? PRAYER.